Why provide a nest box for a woodpecker capable of excavating its own cavity? 1. Flickers are weak excavators, requiring the dead wood of a snag or rotten limb. Such natural nest sites are rare in communities where humans tend to remove such valuable resources. See snags in the home habitat. 2. 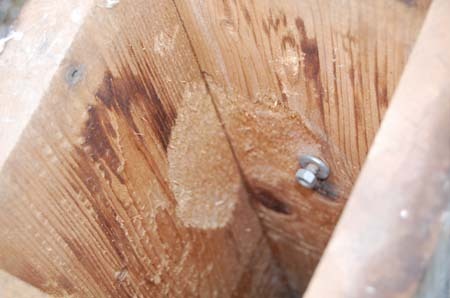 Lacking natural nest sites, flickers will often attempt to excavate the hollow sounding walls of homes, especially with stucco or relatively soft cedar siding. 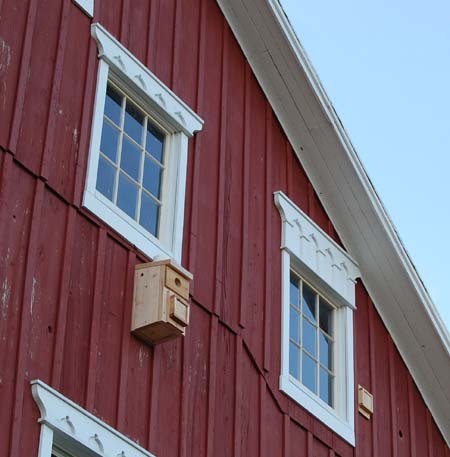 The resulting severe property damage can usually be prevented by promptly installing a nest box on the wall near the damage or on a post nearby. 3. 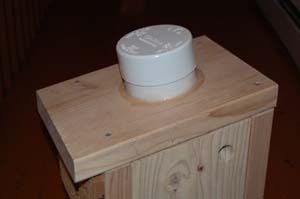 Use a flicker box to attract yet another cavity nesting species to your yard. A diverse habitat, including a variety of nest boxes, leads to a diversity of species. 4. Although still a common species, flicker populations are in significant decline, likely due to loss of snags and unyielding competition from European starlings. 5. 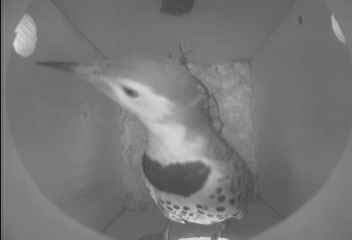 Flickers frequently use nest boxes for winter roosts. The male flicker in our yard is spending every night in the new nest box (late December, 2008) while his mate roosts under the eave of the barn. He found the box 2 hours after I placed it on the wall Dec 4th and has used it ever since. A second box was placed on the same wall today to see if the female will use it. They never enter a nest box together, even when nesting. 1/11/09 Update The female flicker entered and inspected the exterior nest box today, but she is still roosting under the eave at night. The male spends every night in the interior box. His entrance hole is visible at the far right in the top photo. The photo at the bottom of the page is a video frame capture of the female flicker's visit to the outside box today. The box is seen in the top photo. The boxes I've made in recent years for flickers and red headed woodpeckers are made from 2"x10"s. Thin walls, especially of cedar, don't withstand the drumming of woodpeckers from the inside. The interior of this flicker box has withstood 8 years and 3 nestings. 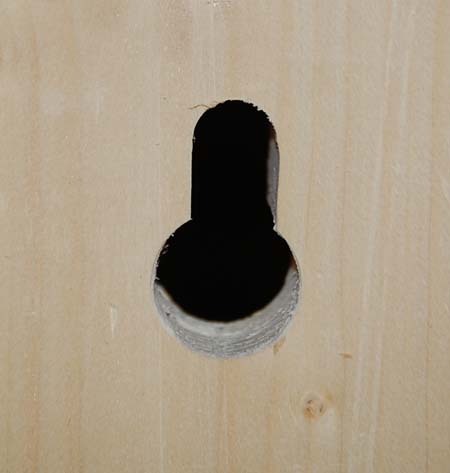 The male tended to tap on this rear corner inside the box to entice the female to relieve him at the nest. Tapping usually doesn't damage wood, but he may have had to tap harder inside the box to be heard outside. The disadvantage of the new box is its weight of approximately 18 lbs. However, a very easy method of mounting the box to a pole or wall makes both placing and removing the box a snap. 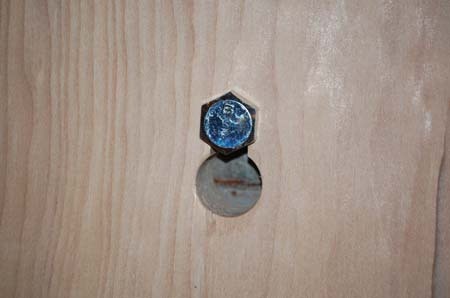 A large keyhole on the back of the box slips over a 1/2" lag bolt, allowing one handed mounting and removal. The weight keeps the box level, even when mounted on a round pole. The 4" diameter camera housing serves both as a convenient way to mount a nest cam and as a large access port for filling the box with wood chips and emptying the box, if desired. While my earlier large boxes for kestrels, owls, and woodpeckers used side doors to empty nesting material, this is a very messy and unsanitary procedure when clinging to a ladder next to the box. This box is simply lifted off the lag bolt and lowered to the ground to empty through the cam port.